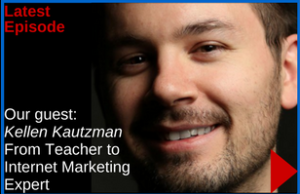 Kellen Kautzman was recently invited as a featured guest on the How of Business podcast. Kellen went to school to become a school teacher, and taught for 5 years before starting his journey to becoming his own boss. He recently separated from his business partner, and has launched his own business – Send It Rising, which offers online marketing services for small business owners. The skills he developed as a teacher related to presentation skills have served him well in starting and growing his business. In this episode, Kellen shares the example of a plumber who has leveraged Google and SEO (Search Engine Optimization) to grow his small plumbing service business. “Create as much content as possible. If it’s not in the internet, it does not exist.” Kellen shares tips for small businesses on how to create and leverage content to improve their search results. He explains how to avoid the fear of creation, which keeps small business owners from creating new content (particularly video content). It starts by educating yourself on the topic of internet marketing before engaging or contracting with a company to manage or help you with marketing. He recommends that you start a maintain a blog. He recommends blog posts on a weekly basis, and then promoting them on other social media platforms. His business can help small business owners to create this content. Blog posts don’t always have to be written words, but can also be video content.